Sweeeeet soul from the 70s! 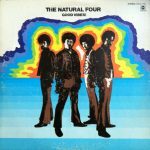 The Natural Four were one of the greatest soul harmony groups of the 70’s – and their work on the Curtom label has an amazing “rough with the smooth” quality that really sets them apart from east coast groups of the time! Part of the strength of the set has to do with Leroy Hutson – who arranged and produced the whole album, and gives it a superdope quality that makes it stand proudly with the best work on Curtom Records of the time. The sound is full and polished, yet also honest, earnest, and personal – in that great mix of moods that Hutson and Curtis Mayfield could bring to their own work of the time. Having formed in Oakland in 1967, Natural Four signed their first recording contract with a local Oakland label Boola Boola Records. Their debut singles was I Thought You Were Mine, which sold over thirty-thousand copies in the Oakland area. After the release of the follow-up, Why Should Me Stop Now ABC Records signed Natural Four, having seen the group’s potential. ABC released Why Should Me Stop Now and the single reached number thirty-one in the US R&B Charts. Two further singles were released on ABC, plus Natural Four’s debut album Good Vibes. Sadly, when Natural Four couldn’t replicate the success of their debut single I Thought You Were Mine, ABC dropped Natural Four from its roster. Then in 1971, after the failure of the single Give A Little Love released on Chess Records, lead singer Chris James decided drastic action was needed. He replaced the other three band members. Remarkably, this worked, with Natural Four signing to Curtom Records in 1972. This saw Natural Four make a commercial breakthrough, with six US R&B hit singles and three albums being released. Each album was produced by Leroy Hutson, including 1974s The Natural Four which not only reached number thirty-six in the US R&B Charts, but featured three hit singles. For the recording of what was the new lineup of Natural Four, lead singer Chris James, Darryl Cannady, Steve Striplin and Delmos Whitney headed to the Chicago, where Leroy Hutson would produce six of the nine tracks on their first album for Curtom. On the release of The Natural Four, the album reached number thirty-six in the US R&B Charts. Three singles were released, with Can This Be Real reaching number 31 in the US Billboard 100 and number ten in the US R&B Charts. Love That Really Counts was the follow-up, reaching number 98 in the US Billboard 100 and number 23 in the US R&B Charts. You Bring Out the Best In Me was the final single released from The Natural Four, reaching number twenty in the US R&B Charts. Chris James’ decision to change the lineup of Natural Four had worked, with three hit singles and a top forty US R&B album the proof. Opening The Natural Four is Can This Be For Real, which Leroy Hutson cowrote, arranged and produced. Opening with a sultry, seductive saxophone drifting above arrangement, Chris James emotive, heartfelt vocal enters. He’s accompanied by tight harmonies from the rest of the group, while the rhythm section, percussion and lush strings. Like the opening track, You Bring Out The Best In Me was another single released from The Natural Four. When the track opens, you realize the quality of the track. Strings cascade, horns rasp and the rhythm section accompany Chris’ vocal. It’s impassioned and powerful, while tight, soulful harmonies accompany him. A pounding bass line is ever-present, while flourishes of keyboards, punchy horns and the lushest of strings drift in and out of the track. This Is What’s Happening Now is quite different in sound as it gives up its secrets and subtleties. Against a backdrop of studio chatter, the rhythm section and guitars build up the drama, while strings shiver and quiver. Then, when the vocal enters, you realize that this track has some of the best lyrics on the album. They’re full of social comment, and remarkably, still relevant nearly forty years later. On Love That Really Counts the tempo drops way down, while the arrangement has a much more understated sound. Guitars reverberate gently, with percussion and rhythm section playing thoughtfully and subtly. The vocals and harmonies have a similar understated and tender sound. Horns rasp gently, strings sweep tenderly as one of the most beautiful ballads on The Natural Four unfolds, with Natural Four delivering some of their most tender vocals. Try To Smile sees the mood change, with a track whose irresistible, hook laden charms sweeps you along in its wake. Bursts of blazing horns, rhythm section and cascading strings accompanies Chris’ vocal. Harmonies sweep in, with the rhythm section adding to the track’s drama and the strings adding to its grace and beauty. Strings shimmer and quiver, as Love’s Society opens. Chris’ vocal is tender, thoughtful and impassioned, accompanied by harmonies that sweep in. A piano meanders in and out of the arrangement, as do stabs of Hammond organ. Key to the track’s sound is the braying horns, shivering strings and a rhythm section that mix subtlety and drama. This is a fitting backdrop, considering the quality of the lyrics, which Leroy Hutson cowrote with Joseph Scott and Roger Anfinsen. Natural Four’s second album The Natural Four sees a very different group, not just in personnel, but different sounding group. Their music is much more accomplished and polished. The only thing that remained the same was Chris James’ lead vocals. However, the three new members were key to Natural Four’s new sound. Not only did they contributing tighter, sweeter harmonies, but when they take turns of sharing the lead vocals, their voices were a better fit. With music as good as this, this leads me to wonder just why Natural Four’s second album, and first album for Curtom Records, wasn’t a much bigger success. It only reached number thirty-six in the US R&B Charts, but did contain three top forty US R&B singles. After this, Natural Four would only release two more albums 1975s Heaven Right Here On Earth and 1976s Nightchaser. 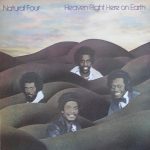 Although Natural Four didn’t find the success their music deserved, is an album full of Good Vibes where Natural Four take you to a place that’s Heaven Right Here On Earth. The great Leroy Hutson and the voice of Chris James means Smooth Soul at its best. Love it. Love The Natural 4, excellent group of singers. Killer sweet soul. Excellent group. “You Bring Out The Best In Me” is my fav here. They nailed that one﻿. Thank u for those great albums by the Natural Four. I love Heaven Right Here on Earth more out of the three. it remains underrated yet criminally addictive. As always, thanks for sharing some great music! This is when music was music and men knew how to sing. Can This Be For Real – is my jam – that sax and the vocal harmonies.